RedDoor Homes has got the sleigh bells ringing with the first entry in our Christmas video competition. The Rochester-based agency ponders whether selling a property should be on your Christmas list this year, with cameos from some recognisable characters. We even get Santa’s perspective on Brexit. We want to see your best agency-inspired Christmas videos. Can you recreate a classic video advert in your office from a well-loved brand? 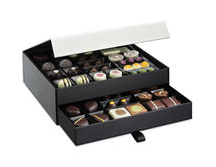 The winner will receive a Hotel Chocolat Classic Chocolate Cabinet to share with colleagues. Entries must be received by December 17 and submitted via our video page. Excellent as always from Red Door Homes. Is it a cracker? Nope, it’s a turkey. You cant have Xmas without a turkey, like you cant have xmas without a RedDoor Homes video.